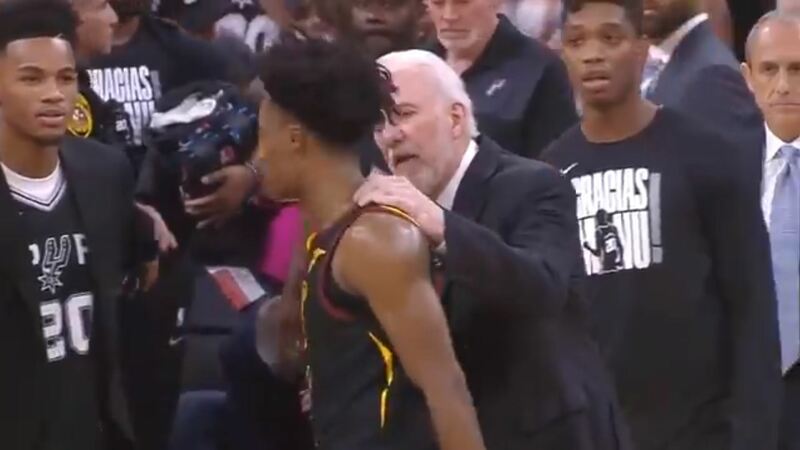 Legendary head coach Gregg Popovich showed some love to Cleveland Cavaliers rookie Collin Sexton after his San Antonio Spurs defeated the Cavs, 116-110, on Thursday night. Despite the Cavs’ loss, Sexton was one of the bright spots, putting up 24 points, two rebounds, and three assists. He shot 10-of-17 from the field overall, and sunk three out of his seven 3-pointers. Throughout his coaching career, Popovich has made heartfelt gestures to several players he truly appreciates and respects. This latest show of respect from arguably the greatest coach in NBA history serves as a testament to Sexton’s potential, hard work, and tremendous improvement he has shown in his rookie year. For the season, Sexton is averaging 16.4 points, 3.0 rebounds, and 2.8 assists, and has made himself a worthy candidate for All-Rookie First Team honors. The Cavs play the Spurs once more this season on April 7.